Posted by Gyaniz in Ads, Marketing, News You Can Use. 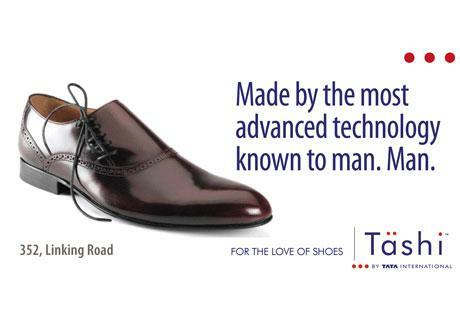 Tata International, the global trading arm of the Tata group and India’s leading leather and leather-products exporter, announced its foray into footwear retail with the launch of Tashi, a speciality footwear retail chain. The company unveiled its first retail store at Greater Kailash, New Delhi. Spread across 2,500sq ft, the Tashi store at New Delhi brings the latest and most elegant fashion trends in footwear and leather accessories to customers all under one roof. In the first phase of the rollout, Tata International will open six exclusive Tashi stores in Mumbai, New Delhi and Chandigarh. The speciality footwear retail chain will have exclusive stores located at high streets, major city markets and leading malls to ensure maximum brand visibility and customer accessibility.